Now that we know all of the major specifications of the new 2015 (“S550”) Mustang, except the final HP and torque numbers, and the weight, it’s time to open up our crystal ball again and take a look into the future beyond just 2015. At the point in time this article was written, the first special edition model has also been seen and dissected to a degree – we know all about the suspension and brakes and are just waiting for Ford to reveal its engine. Which should become clear fairly soon as the development is obviously nearing completion and an announcement will probably happen in the next few months. But what comes next in the longer term? Will there be a V-8 engine at all, or will there be alternatives? We believe the answer is: yes and yes. We believe the Coyote V-8 engine, along with the S550 platform, will last about 10 years. The Coyote will evolve: it may get a small displacement bump at the high-end and maybe even loose a few cubes at the low-end. But the platform is now set in stone… perhaps a few minor new aluminum parts like doors and roof could be added later but what we’ve seen is it. The only remaining question there is the weight. In the longer term, we think the relevance of the Coyote is the real question to explore. And there are two sides to this story: the first is the historical (and maybe egotistical) need for a V-8. Obviously some day far in the future there won’t be one, and also obviously the chassis is ultimately dictated (and compromised) just by the requirement to house one “do-or-die”. That means a certain size engine compartment, and a certain inherent weight of all the components and the car as a whole. The second is the potential of other solutions. The EcoBoost 3.5 has a lot of untapped potential, and could easily out-power the 5.0 while providing better emissions and mileage. And a better experience for the driver, as the torque is spread and maintained across nearly the entire spectrum, and the front end weight would be reduced even more. 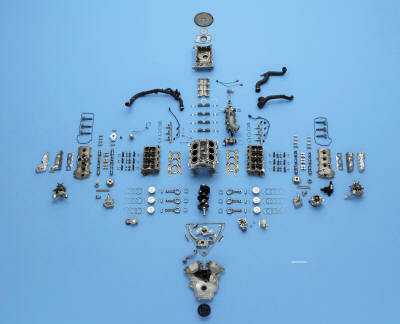 Ford could easily out-do the new M3’s boosted 6 with this engine… and outsourcing the transmission with a sophisticated 7-speed manual or even a dual-clutch (off the shelf from Getrag, just costs in cubic dollars and calibration) would make for a very sophisticated and fast Mustang. And it would match GM if their new twin-turbo V-6 were to be offered in the upcoming 2016 Camaro. The compromise position and the likely reality in the longer term is to make the alternatives more appealing to more buyers, leaving the V-8 for only the very high-end models, while continuing to press home the advantages of smaller EcoBoost engines until one day they are foremost in the minds of buyers. This “re-blending” would also make for less development cost. The EcoBoost 3.5 and Coyote 5.0 are “and-me-downs” from the F-150: the basic engineering budget is paid for there, so the only costs to the Mustang team is any engineering of those above the base. Somebody once said in the press, and we think it was a Corvette development engineer, that the more important figure is pounds/horsepower – not pure HP. The current Shelby has a nice HP figure but is heavy to the point of obesity as well as mismatched weight distribution – so a good part of that power is wasted (and another very large chunk of it is also wasted by lousy traction) and the HP figure is not especially meaningful in the real-world. Fix weight and traction, get a better fr/rr weight balance, and you would have a superior car in every dynamic measure. So taking significant weight off the front end, and producing very high torque and having it available across the entire rev range, is very appealing. The 2012-2013 Boss 302 is the current Mustang high-water mark in handling – but its single worst feature is the horribly dated suspension architecture and the resulting compromises in tuning, followed by its weight: 3632 pounds, and a 55/45 weight balance. That’s too much overall weight, and especially too much on the front end. That means poor traction, too much mass, poor braking, and lousy weight transfer (and, with the lousy suspension design of the S197, far too much brake dive). We have two cars in our personal “fleet” with a 50/50 weight distribution, and once you’ve driven cars with that kind of balance everything else fades in comparison. And not just on the track, but in everyday driving where you can transfer the power to the pavement far more efficiently and in more conditions. The V-8 mindset… there will be a V-8 for ten years so this is a perception and education problem. It will fade in the minds of the majority of buyers only if and when they are presented with more interesting alternatives. The V-8 competitive situation. The Camaro will have on Day One or very shortly thereafter the new supercharged direct-injected 6.2 liter V-8. One heckuva fabulous engine. Fact of life, gonna happen, and it’s also a far better engine than the Trinity is or could ever be. So the Mustang has to respond with something. Warranty. If the EcoBoost 3.5 is offered, somebody will start modifying these to 600, 700, 800 HP. The Supra TT went thru evolutionary steps of 500 HP, 600, 800, and 1000 (and easily survived since it was so well over-built). The EcoBoost 3.5 probably isn’t up to such stresses as 600 HP (but could be with a new block). Shooting flames out the back of the car when entering the Ford dealer won’t get you a good relationship with your service or zone manager! Nonetheless, people would start trying to claim warranty costs from poorly done modifications. Ford doesn’t need another warranty disaster (as with the Terminator, which self-terminated in so many cases). For the ultimate V-8 numbers model, we’d rather drive a turbocharged engine than a supercharged engine (which for track use has inherent and unavoidable heat sink issues)… but we just can’t see how a pair of turbos would fit in this engine compartment (and they have to fit and meet production standards, so the types of things the current aftermarket does here won’t cut it at all). The engine compartment in the S197 is extremely tight; the S550 with its corners cut back is even worse (although identical in the space between the frame rails and strut towers, since this is just an evolved S197) , and the fuse box and airbox make the idea of a pair of turbos even more far-fetched (don’t use the Cobra Jet prototype as an example because the far-forward location of its turbos is not at all “production-able”). So all we can see here is a supercharger. 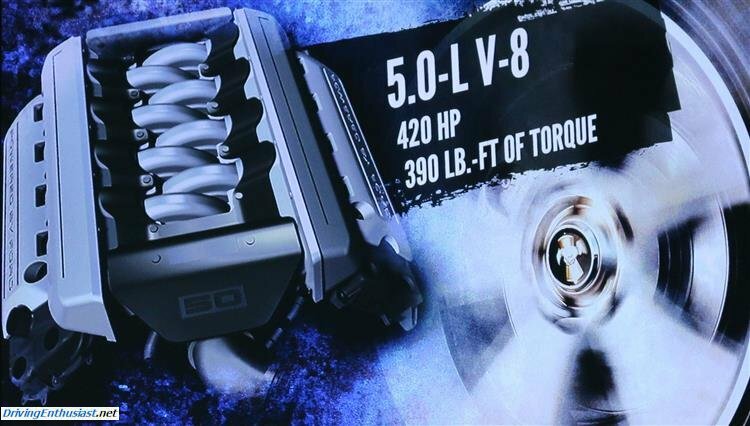 For the Boss302-type model, which has to be naturally aspirated or turbocharged (and extremely well cooled) to survive the heat issue on-track, there can’t be a supercharger. We a heavily reworked Coyote here (with a rumored but not confirmed slight displacement bump and/or the wild-to-the-point-of-ridiculous rumors of a “flat crank”). Call it a Boss 302 or call it a GT350 (and we hope not, because the old snake oil merchant had nothing to do with this or the last GT500 except collecting royalty payments). This model could easily be better yet with an upscale EcoBoost 3.5. If the weight could be kept significantly down (and we don’t know that aspect of the S550 yet). And moving to an enhanced EcoBoost 3.5 would take a few years of development so it wouldn’t be immediate. For a GT500-type successor, whose sole point is apparently to get a very high $$ margin in return for a very high HP number, we see in the short-term either the Trinity for a few years (which, with moving a couple of hoses, does fit), or a yet-to-be developed supercharged Coyote (which the Australians have already done, although it doesn’t make any real HP improvement). Back to “the numbers”. We don’t see any point in this day and age with trying to get the ultimate HP number at the expense of everything else. The Z/28 and ZL1 handily fit the bill for #1 and #2 above and they do it without having the ultimate HP number. Instead, both provide the ultimate and very well-rounded experience. Each in its own way (and the Z/28, with the lower HP number, is a far better track car than either the ZL1 or GT500). Since the Mustang has matured significantly in the S550, this philosophy ought to fit. What would make a huge differentiator on top of this would be two zingers: a torque-proportioning rear differential, and a sophisticated transmission. Both could be sourced from Getrag and both are already offered in other upscale cars. The differential would make an enormous handling improvement, taking all the dynamics far higher. Now that we finally have a standard IRS, this is an easy engineering change form a mechanical standpoint, although the big effort would be in the electronic calibration. And it’s expensive; this might be a $2000 option or more. But the benefits are so profound that we’d pay $4k for it. A better transmission is needed above the wretched MT82 (even with an improved shifter for 2015, and unspecified minor improvements, it still has a low torque rating and that means that it has zero room for growth). We need 7 gears for an upmarket Mustang and eventually a performance dual-clutch. The TR6070 is an obvious choice, but it has about 50 pounds more weight, and it also has the wrong gear ratios for a high-revving V-8 (versus a pushrod V-8, for which the basic unit was designed 30 years ago). Closely spaced gears are critical to the character of the Coyote, and Getrag has the better transmissions off-the-shelf. This wouldn’t be expensive. They also have appropriate dual-clutch options, and while this would be expensive the performance (and also mileage and emissions) benefits are extensive. This type of transmission is a key to keeping a high HP engine in the Mustang in the long run. It’s also expensive, but since we’re talking a special edition model here, we’re also spending more anyway. But we don’t see a new differential or transmission in the short-term. Instead, we see some sort of engine bump above the base Coyote, and (as obvious in the prototype seen) the full exploitation of the new suspension. With *big* brakes all around, 6-piston front and 4-piston rear (finally multi-piston in the back!) and 295s on 19s, the handling bar will be raised considerably. So that will suffice in the short-term. (Side note: we’re conflicted about proportioning torque with the brakes alone. It works great on the street and is easily engineered on the mechanical side (the tough part is in the programming). But right now we can’t see it as an advantage for the Mustang track model because of the extra stress it puts on the brakes. Some of you may have noticed that this is the weak link for the Focus ST on the track, which is otherwise terrific. The new STi also uses this method… but unlike the ST has big Brembos all around to help make up for it. We haven’t seen enough real track testing of the STi yet to know if it works there or not). Ford will have to focus very carefully on achieving a successful launch in North America, followed by the worldwide launch a year later. And of course as we know there will be some sort of special edition at day one or very close to it. Keep in mind that launching a new car is a very complex and expensive process… so the engineering and production teams will be very busy right thru the 2016 MY. That process has to be successful, along with an immediate and sustaining sales boost. It’s all about revenue, and that is the only thing that will lead to further engineering investment in the S550, and hopefully some day to a truly all-new chassis.